The horn guides for the leading and trailing axles have now been fitted. However they have been removed again for security purposes. The horn blocks for the centre axle are yet to be dealt with (when we have all stepped up to three Shredded Wheat for breakfast!). We have also been busy with the construction of the cross stays which are pinned to the horn guides and horn blocks. There is still quite a lot of work remaining to complete these at the time of writing. Pressure of work at the engineering company has meant that the smokebox saddle has been in a queue for machine availability. The saddle has been shot blasted and is expected to be machined soon. Our popular tombola will be held again at the SVR Autumn Steam Gala and once again we are appealing for prizes to be donated. Suitable donations include wine, spirits, chocolates, biscuits, perfume, after shave, indeed anything which will be attractive to our visitors. This Gala will be a very popular event so we really need a good collection of prizes. Gifts may be delivered to Brian Oldford c/o Bridgnorth MPD for collection by Tony & Barbara and the "Monday Gang" will always be glad to take delivery of items. Thank you for all the lovely prizes we have been given in previous years which have made our tombola a great success. Now that the frame assembly is nearing completion, we are turning our attention to raising the funds for wheeling 82045. As reported in the News Updates for May, we estimate that the whole job will cost about £150,000. 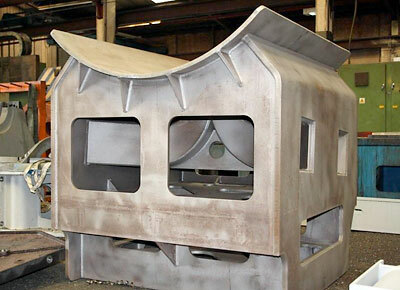 It is essential that we start to build up the necessary capital now, so that we are in a position to move on this vital second stage once the chassis/cylinder assemblies are within sight of completion. We are aiming to be in this position by the late summer/early autumn of 2012. 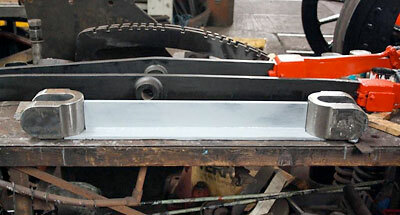 We are considering, as a first step, having the front and rear pony truck assemblies fabricated and the pony wheels cast, machined, tyred and pressed on to axles in order to create a rolling chassis at the earliest possible date, with obvious advantages in terms of manoeuvrability around the Bridgnorth site. and so on. If 1,000 people would subscribe £10 a month for the same period, the job would be done. Gift Aid would increase total receipts considerably, and any excess would be ploughed into the funding for the engine’s boiler and firebox. You will note the 15-month period, which is designed to reduce the amount of the monthly payment slightly, while remaining focused on the timescale we have set ourselves. Every attempt will be made to get as many members of the wider SVR (and there are over 13,000 of them!) on board. The Railway is clearly and unequivocally going to be 82045’s home, and the ingredients are there for the perfect business relationship: the Valley really needs the loco – and we want to build it for them, as quickly as possible. Watch this space for further information from Chris. If anyone feels able to set up a separate limited-period (15 months) standing order specifically ring-fenced for the wheels, please get in touch with him. And try to persuade your friends, too. Thanks! 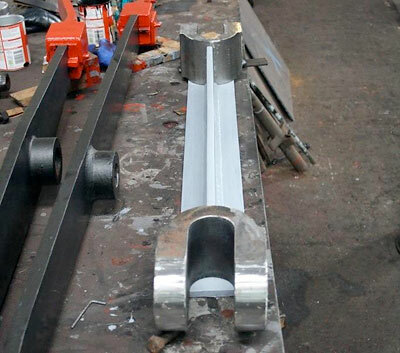 The smokebox saddle awaiting its turn for machining at Machined Fabrications, Dudley. 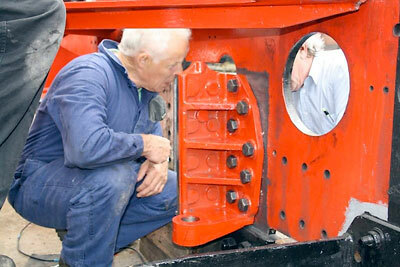 Bryan Clarke checking the fit of one of the left hand side leading horn guides. Two views of one of the cross stay under construction.